Simple GridSupport with an open area of 75-80%. Pressure drop estimated at .45" WC. SimpleGrid Support with an open area of 75-80%. Pressure drop estimated at .45" WC. Design permits installation through manway, size to be specified by column designer, normally 24". All necessary assembly hardware included. 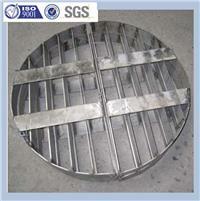 SimpleGrid supported by circumferential ring furnished as integral part of the column. SimpleGrid may be self supporting. Lantec will advise if addional support beams are required.